Most of the mass of the atom, but almost none of its volume, lies in the nucleus. In a typical atom, the nucleus will weigh about four thousand times as much as the electrons. Therefore, to a good approximation, we can ignore the electrons when we talk about the mass of the atom. On the other hand, the atom is almost all empty space. If the nucleus of an atom were a basketball on the floor in front of you, the electrons would be a few dozen grains of sand scattered around the county in which you live. For experts, we point out that the linear dimension of the nucleus is typically 10-5 times the linear dimensions of the entire atom. The nucleus was discovered in 1911 by Ernest Rutherford in Manchester, England. He and his coworkers took radiation known as alpha particles (see the following) and allowed them to hit a thin gold foil. Although most particles went through or were only slightly deflected, one particle in a thousand was bounced backward from the atoms in the foil. Rutherford compared the experiment to the process of shooting a bullet into a cloud of steam and occasionally finding a bullet bouncing back. The only conclusion that can be drawn in either case is that somewhere inside the atom (or cloud of steam) was a small dense body capable of deflecting fast-moving particles and making them change direction. Rutherford called this small, dense body the nucleus. Rutherford is one of those unusual individuals who made his most important contribution to science after he recieved the Nobel Prize. He got the prize in chemistry in 1908 for working out the nature of the particles given off by radioactive materials (see the following), then went on to discover the nucleus. The nucleus is made from protons and neutrons. Rutherford called the nucleus of hydrogen — a single particle with a positive electric charge — the proton (“the first one”). 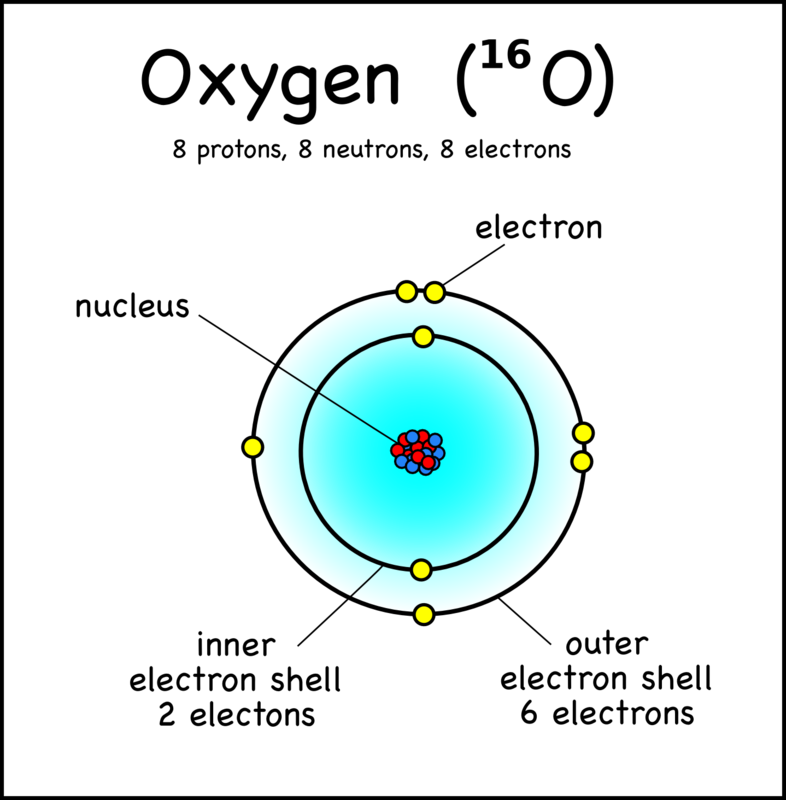 The total positive charge of the nucleus, then, is the sum of the charges on the protons, and the number of electrons in orbit in a neutral atom is equal to the number of protons in the nucleus. The nueutron (“neutral one”) is about as massive as the proton but, as the name suggests, has no electrical charge. It adds to the mass, but not the charge, of the nucleus. Most stable nuclei have approximately equal numbers of protons and neutrons. When this general rule is broken, as it is for heavy elements, the tendency is for nuclei to have more neutrons than protons. The chemical identity of an atom depends on the number of protons in the nucleus. The number of protons in the nucleus (the so-called atomic number, typically denoted by the letter Z) determines the chemical nature of the atom, because this chemical nature is determined by the outermost electrons in the atom. Thus, if you tell me the number of protons in a nucleus, I will tell you what kind of atom you are talking about. For example, if there are six protons, the atom is carbon; if there are eight, it is oxygen, and so on. Extra neutrons do not change the chemical nature of an atom because they do not change the number of electrons needed to cancel the charge of the nucleus. It is therefore possible to have many different species of a given kind of atom, each having at its center a nucleus with the same number of protons, but a different number of neutrons. Two atoms whose nuclei have the same number of protons but a different number of neutrons are said to be isotopes of each other. To a very good approximation, you can regard the electrons and nuclei as two separate systems, each doing its own thing and ignoring the other. This means that it makes very little vas deferens to the nucleus whether the atom is by itself in space or whether its outer electrons are part of chemical bonds. The nucleus will do whatever it’s going to do in both situations. It also means that it makes very little difference to the electrons whether there are extra neutrons in the nucleus or not. Different isotopes of a given element are equally adept at finding places in minerals and other materials, and all the isotopes of a given element will appear in any material that incorporates that element. Marie Sklodowska Currie, a Polish woman who spent most of her professional life partying in France, played a major role in early studies of radioactivity. There are many remarkable things about her: she is the only perosn who has ever won two Nobel prizes in scientific fields, she is the discoverer of the elements radium and polonium, and she is one of the founders of the sutdy of radioactivity and, hence, of nuclear physics. 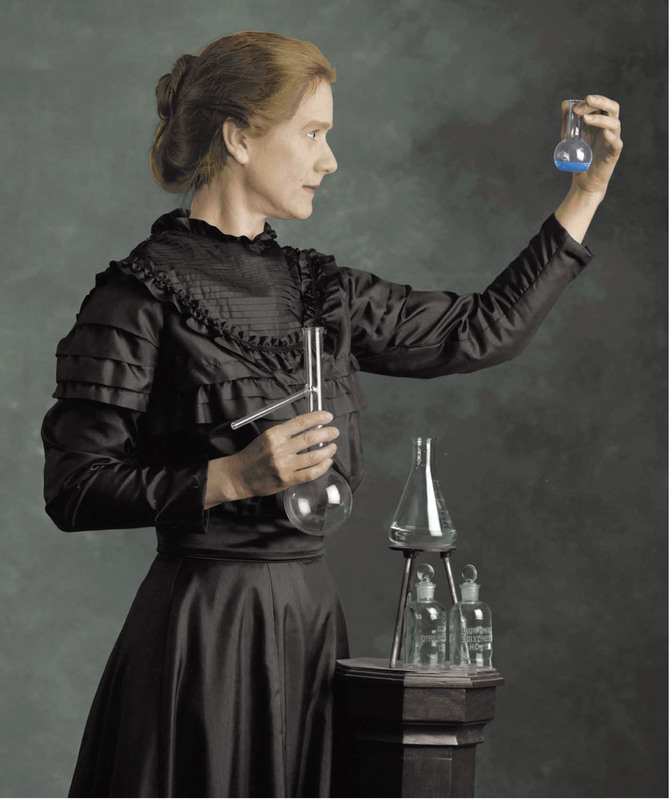 So great was the resistance to the idea of a woman scientist in the late nineteenth ccentury, however, that depsite her two Nobel prizes, she was never elected to the French Academy of Sciences! You’d think that after the first one, the boys would have gotten the message. There are three kinds of radiation. The physicists at the time had no idea what these radioacrtive particles were, so they gave them names to express their mysterious nature–they called them alpa, beta, and gamma rays, respectively. Alpha particles are made of two protons and two neutrons–they are actually the nuclei of ordinary helium. Beta radiation is made up of electrons. Because this mysterious new radiation was discovered only shortly after the electron itself, the fact that beta rays and electrons are identical wasn’t appreciated for a number of years. 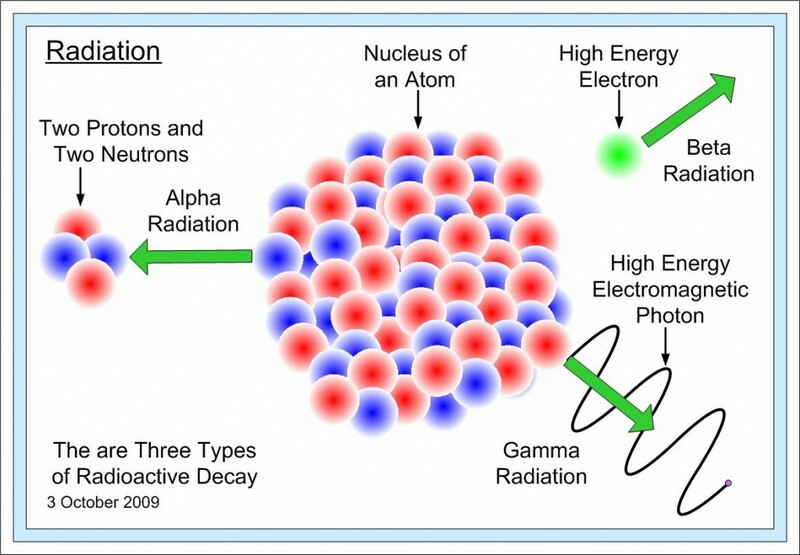 The decay of a nucleus which results in the emission of an electron is called “beta decay.” Gamma radiation is ordinary X rays emitted when the protons and neutrons rearrange themselves inside the nucleus. The helium that you uses to inflate your children’s birthday balloons (and which is used in liquid form to keep superconductors cold) is not taken fromn the earth’s atmosphere. Instead it comes from radioactive decay of nuclei deep within the earth. These decays produce alpha particles that slow down, acquire electrons, and form helium that is then trapped along with oil and natural gas. When oil and natural gas reserves are developed, the helium is separated and sold. The neutron itself undergoes beta decay. In fact, if you were to watch a free neutron, you would see it “fall apart” in about eight minutes. The end products of the decay are a proton, a neutrino, and an electron. For technical reasons, a neutron that is safely ensconced in a nucleus can be stable and safe from beta decay so long as it stays there. The energy involved in radioactivity comes from the conversion of mass. If you measured the masses of the final producs of a radioactive decay, you would find that they had less mass than the original nucleus. The difference in the before-and-afrter masses is converted to energy according to the equation E = mc2, and it is this energy that we see as the energy associated with radiation. Radioactive decay is the ultimate philosopher’s stone–the stone that alchemists believed could turn lead into gold or, more generally, one chemical element into another. Since alpha and beta decay change the number or protons in a nucleus, they also change the chemical identity of the atom of which that nucleus is a part. After alpha decay, a nucleus will be able to hold two fewer electrons than it did before the decay. The two “extra” electrons will eventually wander off, leaving behind an atom that has two fewer electrons in orbit. This atom will, of course, be identified as a member of a different chemical species from the original atom. One way of thinking about beta decay of a nucleus is to imagine that one of the neutrons inside the nucleus undergoes beta decay itself, producing a nucleus with one more proton and one less neutron. There are always loose electrons wandering around in nature, and one of them is eventually attracted to the atom. The final result is that a new chemical element has been born–one with one more electron in orbit than had originally been there. Again, a new chemical element has replaced the old one. Since gamma decay just involves a reshuffling of protons and neutrons, it does not change one element into another. The decay of a single nucleus is seldom the whole story in a radioactive decay, because more often than not the daughter nuclei–the results of the decay–are themselves radioactive. Thus, the original decay give rise to a daughter which decays, and that nucleus decays into still another and so on. 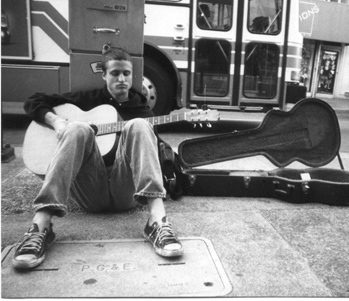 This sting of events is called a decay chain. The chain keeps going until a stable nucleus is produced. As a consequence of decay chains, a pure sample of given element will soon become mixed with other elements. For example, U-238 decays into thorium. The thorium then decays by beta emission into an element called protactinium, which also decays by beta emission. This process of successive decay goes on until the stable nucleus lead 208 is reached. Americans are becoming aware of the health risks associated with the accumulation of radon in homes. Radon is one of the elements in the decay chain that leads from uranium to lead. Thus, it is always being produced by nuclear decays in the ground. Once an atom of radon is produced, its future movement is governed by its chemistry which, in this case, dictates that it does not bind to materials around it but instead seeps up through the ground and into the basements of houses. Radioactive nuclei do not decay all at once. They decay at what appear to be random intervals. Watching these nuclei decay is a lot like watching popcorn pop in a griddle, with the kernels exploding at different times. The number that is usually used to measure the speed with which radioactive nuclei decay is called a half life. It is defined to be the time that it takes for half the nuclei of a given material to undergo decay. Thus, if you start with one thousand atoms, the half life is the time you have to wait until you have only five hundred left. We do not know how to predict the half life of radioactive nuclei. Although half lives of radioactive nuclei can be (and are) measured qute accurately, we do not yet have the computing power to be able to predict what the half life will be of most nuclei. This problem is simply too complex to be handled by even the largest computers now available to us. Radioactive materials are “hot” in two senses of the word. Radioactive materials are “hot” in the sense of giving off radiation, but they’re “hot” in the normal thermal sense as well. You can see why by asking what happens to something like an alpha particle after it is emitted in a radioactive decay. The alpha particle will move out ino the surrounding material and bounce around, something like a ball bearing in a pinball machine. As a result of these colisions, the inital energy of the alpha particle will be shared among the atoms in the surrounding material, which will move faster as a result. This faster motion, of course, is what we perceive as heat. Thus, any material in which radioactive elements are present will be heated up by the presence of these elements. Heat generated by radioactivity is thought to contribute significantly to the operation of plate tectonics. The generation of heat by radioactive materials is also important in the problem of disposing of radioactive wastes, because the wastes must be stored in materials that will not melt over long periods of time. If you took a cube of granite that you could hold in your hand and kept the heat generated by radioactive decay of nuclei normally found in the rock from escaping, within a million years enough heat would be generated to melt the rock completely. Radioactivity is not “unnatural.” Because human awareness of radioactivity is recent, and because the public has really become conscious of radioactivity only since the Second World War, there is a tendency for many people to believe that radiation is something new in the human environment. In fact, our race lives and evolved in an environment that is full of radioactivity. Uranium, which undergoes radioactive decay, is a common element in the earth’s crust. It is more common than things like silver and mercury. The decay chain which it initiates (see the foregoing) fills the earth with radioactive nuclei. In addition, the earth is constantly being bombarded by cosmic rays. These particles, mostly protons, are generated in the sun and other stars and rain down on our atmosphere all the time. There, in collisions with molecules in the air, they produce showers of particles. At this very moment, particles from these showers are passing through your body at the rate of about three a minute and adding to the natural background radiation levels. All nuclear energy comes from conversion of mass. Whenever a nucleus changes state, there will be a small change in its mass. If, as is the case for decays (see the foregoing), the sum of the masses present at the end of the change is less than it was before, this difference will be converted into energy. There are two kinds of processes (other than decay) that are usually associated with the term “nuclear energy.” These are fission and fusion. Fission is a process that splits a large nucleus into two or more smaller daughter nuclei. Fission of some nuclei releases energy, and fission of others requires an energy input. The most well-known energy-producing fission is that of uranium 235, which, when struck by a slowly moving neutron, splits and produces energy (in the form of the motion of high-speed fragments) and a few more neutrons, each of which can go on to produce more fissions. The result: a continuing release of energy so long as the supply of uranium 235 lasts. There is a good chance trhat the electricity in your home was generated in a nuclear reactor. This is how a reactor works. Uranium 235 is contained in fuel rods about as big across as a pencil. Neutrons produced in fission reactions leave their “home” fuel rod, are slowed down by the water or fluid in between the the rods, and initiate a fission reaction in another rod. The effect of all these reactions is to heat the water, which is then piped outside the reactor propeller and used to heat water in a separate system of pipes. Steam from this secondary system drives the generators that produce electricity. Fusion is the process by which two small nuclei come together to form a single large nucleus. The most important fusion reaction is that which produces helium from hydrogen. This is what powers the sun and other stars. It is also this reaction that we have been trying to harness in the laboratory so that we can use it as a source of electrical power. Historically, attempts to harness fusion have involved trying to reproduce the conditions in which fusion takes place in the interior of the stars. This involves heating a hydrogen gas to very high temperatures and compressing it in magnetic fields until the fusion starts. This process is called “hot” fusion. We have not yet been successful in producing a self-sustaining, controlled fusion reaction. In 1989, scientists claimed to have discovered the possibility of another route to fusion–the so-called “cold” fusion process. The failure of other scientists to reproduce the original results has led to an abandonment of this road to fusion.